Q. How do I authorize my ArcGIS Desktop (ArcMap) version 10.x software? Note that this process must be completed upon installation and on an annual basis. In January of each year, download a new authorization file from the Library's website, as indicated below, and repeat this process. Your software will stop working if this process is not completed annually. Ensure that you have downloaded and installed the ArcGIS Desktop (ArcMap) software. Instructions are available from the Library's website. MacOS users are reminded that ArcMap only runs in a Windows environment. Download the authorization file from the Library's website. Run the ArcGIS Administrator Wizard. After installing ArcGIS Desktop (ArcMap) and closing the installer, the ArcGIS Administrator Wizard opens automatically. Otherwise, navigate to your Start Menu > All Programs > ArcGIS > ArcGIS Administrator. Under "2. Launch the Authorization Wizard for Single Use products" click the Authorize Now button. In the resulting page, select "I have received an authorization file and am now ready to finish the authorization process." Click the Browse button and navigate to the authorization file that you previously downloaded and saved to your computer. The file name is entered into the Browse box. Click Next. Select "Authorize with Esri now using the Internet." This requires a live internet connection. A form with name and contact information appears. Do not change the information that is automatically entered. Click Next. Enter the additional classification information according to your identity. Click Next. An authorization number is requested but has automatically been entered into the field. Do not change the information that is automatically entered. Click Next. 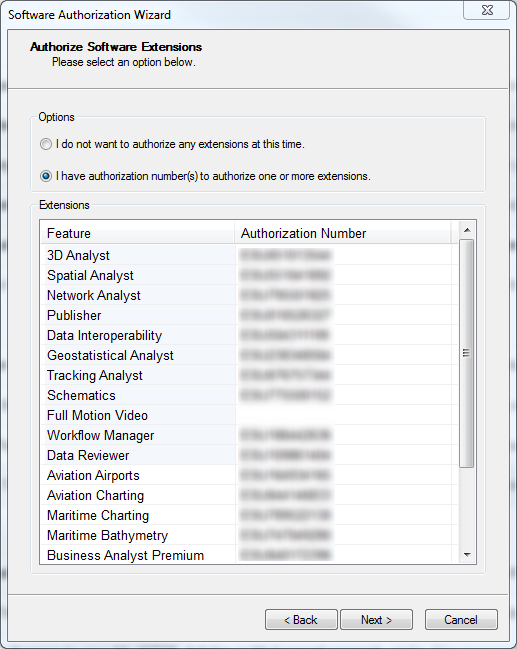 Authorize all software extensions by selecting "I have authorization number(s) to authorize one or more extensions." Click Next. Do not elect to evaluate additional software extensions. Click Next. The Authorization Wizard will connect with Esri's server to authorize the software. When it is finished, it will indicate if your software is authorized and ready for use. Click Finish. Open ArcGIS Administrator. It can often be found at Start Menu > All Programs > ArcGIS > ArcGIS Administrator. 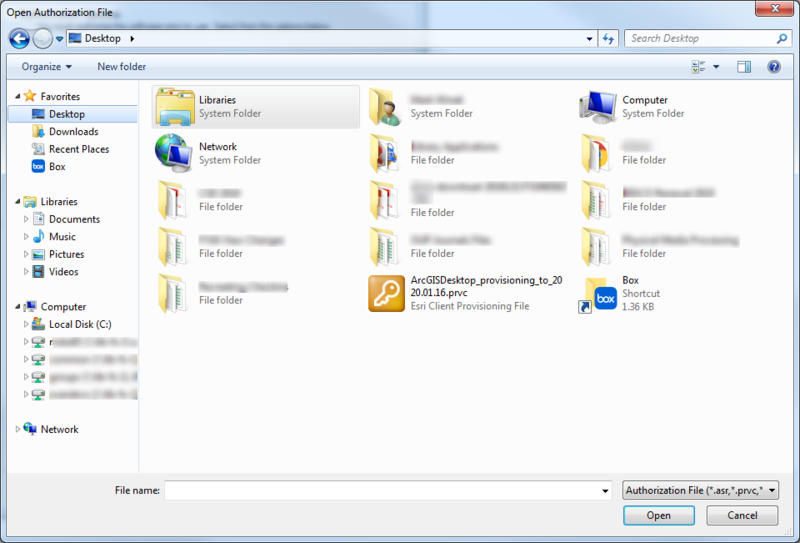 In the file hierarchy, click on Availability under Desktop. The table that appears should show an expiration date of "16-Jan-20XX" indicating when the software will expire.